One of my favorite things about reading historical fiction is getting to discover something or someone from the past. In the case of The Forgotten Queen, I get to do both. Margaret is the older sister of King Henry VIII. She is married to James, King of Scotland in order to hopefully bring peace between the two countries. She’s told from the very beginning that peace is her job as queen. She holds on to that tightly, even when things get tough. Margaret knows from an early age that her choices are not truly her own. Because she is a woman, her marriage is a bargaining tool. She can never rule in her own right, and her opinions on anything other than dresses are generally not looked upon as valuable. She fights back in her own way, choosing her second and third husbands and trying to do what is right for Scotland through her son. Bogdan wrote a perfectly flawed character. Margaret is in love with the idea of love and that clouds her judgment at times. She loves a little too much, but that is both a strength and a weakness. She makes decisions having the best intentions at heart, even though she doesn’t always think her actions through. I loved reading a character, even one based on fact, that is a completely human character. It makes her come alive. The true sign, to me, of a great historical fiction novel, is one that makes me want to learn more after the last page has been read. 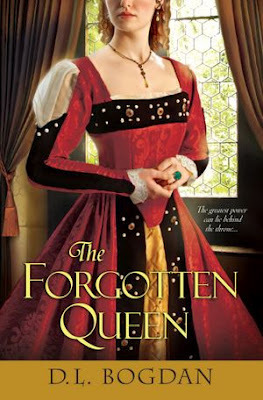 The Forgotten Queen was one of those books. As soon as I had finished reading, I was looking up more information. I had known of Margaret before reading, but after finishing the novel, I feel like I know her a little bit more. This is definitely a book for anyone interested in the other members of the Tudor family. There were a couple times when the tone of the novel felt a little off, but that doesn’t get in the way of enjoying the story. This look into the life of Margaret is a wonderful read and a great historical fiction novel. Thank you to Kensington and NetGalley for the advanced copy in exchange for an honest review. This entry was posted in Historical Fiction, The Must Reads and tagged D. L. Bogdan, Historical Fiction, Must-Reads.